For soccer players, there are many landmark moments in a career; a first appearance, a first win, a first trophy. Perhaps the most memorable and distinguished for many players, though, is a debut game for your country; representing your nation on the international stage. And it’s no different for officials. 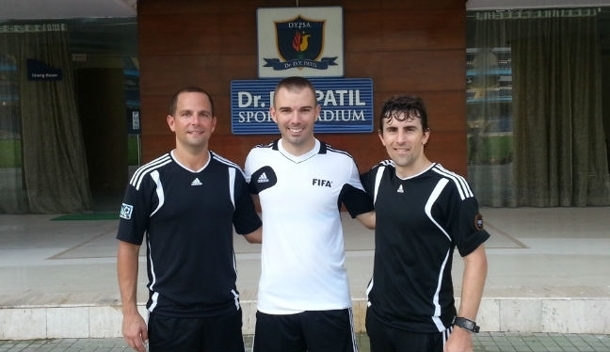 Assistant referee Mark Cahen is one of the latest Professional Referee Organization officials to work abroad, running the line in eight games over two spells during the 2014 Hero Indian Super League. “The opportunity to travel India and work in the inaugural season of an MLS equivalent, representing North American soccer, was a dream come true,” Cahen reflected to proreferees.com. “I’m not on the FIFA list so this was my first appointment abroad and I am extremely grateful to have been selected. 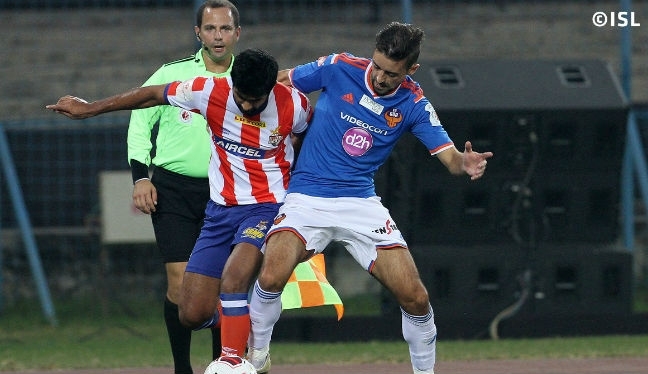 “On my first trip, with Chris Penso and Eric Boria (pictured below), we worked four games, including the first ever Indian Super League game, between Atletico de Kolkata and Mumbai City in October. “I then returned in late November to officiate four more games, this time with Baldomero Toledo, and the last one of those was one of the semi-finals on December 13. Attracting former World Cup winners like Frenchman Robert Pires and Italian Alessandro del Piero, the Indian Super League had a number of famous names playing across all eight franchises in the opening season. PRO was asked to send over a handful of officials to assist, with Cahen catching the bug for international assignments while in Asia. But the trip wasn’t without its moments. “Before the third game, between Mumbai and Pune, we were staying in a hotel where I couldn’t block out the noises of cars and scooters from outside,” added the 34-year-old Florida resident. “I was unable to shut the window to drown out the sound, so got the hotel maintenance to assist me, but when we came back into the room there was a pigeon flapping around. “It’s one of the more unusual things to encounter, but we eventually got the pigeon safely out and I was able to get to sleep. “There were many other challenges with Indian soccer in comparison to the US. One of those was being able to adjust to the hot weather and high humidity, so eating right and staying hydrated was essential. Cahen – who kicked-off his 2015 MLS season by running the line in the Houston Dynamo versus Orlando City game during week two – believes his experience helped him stay match fit and focused over the off-season. There will hopefully be further opportunities for PRO officials to work in the ISL this year when it returns on September 15.